The law governing dog bites can be found in state laws, county and city ordinances, and rules developed from actual cases. Dog bites can fall under both civil (personal injury) and criminal law. One of the most interesting rules is an old English law called the “one bite rule.” This ancient law protected a dog owner from criminal or civil liability/responsibility until the owner had a certain degree of knowledge that his dog is dangerous. Most states have ended the “one bite rule” and now dog owners can be held liable if their dog bites a person and the victim was not trespassing or provoking the dog. Dog bites occur every day and can vary greatly in severity. The statistics on dog bites as reported by the American Humane Association give a good look at the number of dog bites as well as who is at most risk. Unsupervised newborns are 370 times more likely than an adult to be killed by a dog. There are some danger signs that every person should be aware of when dealing with strange dogs. It is particularly important to teach children to exercise caution when approaching or trying to handle an unfamiliar dog. There are several factors that are commonly present in dog bite attacks. Usually, there is more than one dog present in the yard without the owner supervising. 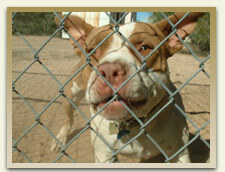 Pit Bulls, Rottweilers, Akitas, and Chows are more frequently involved in attacks than other breeds of dogs. It is important to beware of pack mentality, especially if there are many dangerous dogs in one area. Also, a dog is not necessarily safe just because it is chained up and can still attack if you get too close to them. If you are walking in your neighborhood, there are some steps you can take to protect yourself from attacks and to minimize harm if a dog does decide to attack. If a dog approaches you, be sure to control your emotions. Never make direct eye contact with the aggressive dog and speak in a calm but firm voice. If a dog attacks you, assume a firm stance, protect your throat with your arm and use anything handy as a barrier between the attacking dog and your body. Even something as small as a purse can be used as an effective shield. If you are knocked down, curl up into a ball to protect your head, neck, and abdomen. Consider carrying a device, such as a walking stick, that can be used as a deterrent to any approaching dogs. If you have been the victim of a dog bite in Jackson, Mississippi, please contact Coxwell & Associates, PLLC today to schedule a consultation.